TWO WINNERS! ENTER FOR YOUR CHANCE TO WIN THEIR OWN Holly Jolly Holiday Ring Pops LIKE THE ONE BELOW AND BE SURE TO CHECK OUT THE FULL REVIEW FROM SaraLee's Deals Steals & Giveaways.ALL OPINIONS ARE HERS! 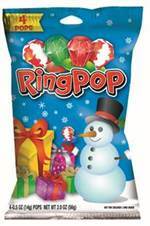 I have always loved Ring Pops since I was a child.These Holiday Ring Pops are wonderful stocking suffers for your child/children. Bazooka Candy Brands would like to help some of SaraLee's Deals Steals & Giveaway's lucky readers ring in the holidays with an early Christmas gift – an extra special Holiday Ring Pop Pack giveaway! The holiday-themed Ring Pop Pack features four different flavors Watermelon, Strawberry, and Christmas Cherry Swirl. The candy will be sold at Walmart, Target and Dollar Tree for $1 per pack. Now for the giveaway: Two lucky people will win a bag of Holiday Ring Pops. This is open to US, 18+ and ends 12/01/2013 @ 11:59 pm est. To enter, Simply do the tasks on the Giveaway Tools widget below and you're set to have a chance to win! Remember you can't win if you don't enter.